Microsoft isn’t doing so hot in mobile. That’s been its unfortunate story for years, as it’s played catch-up to Google and Apple ever since Windows Phone 7 launched in 2010. There’s plenty to blame: entering the game late, featuring underpowered hardware, missing features and a lack of apps. At this point, it’s hard to imagine what exactly the company could do to gain serious ground against Android and iOS. But going into Build 2016, Microsoft’s biggest developer event, one thing has become clear though: it has to kill the Lumia. When people talk about the problems with Windows Phone (now Windows 10 Mobile), it almost always centers around one issue: apps – or a lack thereof. But while a scarcity of apps is the platform’s most monolithic hurdle, saying apps are the problem with Windows Mobile is a circular argument – there are no apps, because no one uses the phones, because there are no apps. Android had to play catch up with iOS’ app ecosystem, after all – and to some extent, it still does. You could even argue iOS had to catch up to existing BlackBerry software. Point is, every new platform starts from behind; that doesn’t mean it can’t be successful with the right approach, and, importantly, the right hardware. As a mobile OS, Windows has come a long way. It’s arguably the sleekest design of the big three, mostly at feature parity with Android and iOS, and it even has some nifty additions – Continuum is particularly notable – that the competitors can’t match. And slowly but surely, Microsoft’s Universal Windows Platform will even out the playing field. The ability to build desktop apps that can easily run on mobile devices will have a large impact in the coming years, especially with Microsoft pushing it as the main way to create Windows software going forward (expect to hear a lot of that at Build). Windows Mobile may be struggling, but Windows proper isn’t going anywhere. That then leaves the phones themselves as culprits. Not because they’re all terrible phones, but because no gets excited about hearing “there’s a new Lumia coming out.” If the brand ever evoked that kind of emotion, it certainly doesn’t any more. There’s no greater proof of this than the most recent models, the Lumia 950 and 950 XL. On paper, there’s a lot to like. They launched with specs to match the best Android flagships, even offering power-user features like a removable battery and expandable storage normally the hallmark of team Google. And yet the devices just didn’t come altogether. I’ve used the 950 for several months now, and specs aside, it feels like your average low end plastic phone. It oddly resembled a developer kit more than a flagship consumer phone – fine for the techies like me, but not for the average smartphone user. That the 950 was an AT&T exclusive was the nail in the coffin – it almost feels like Microsoft wan’t really trying. Things weren’t always that way. Earlier Lumia models stood outwith vibrant designs and excellent cameras (and that’s a trait they still have). But the Lumia has been around since 2011, and Microsoft has released over 30 devices with the name since. There have been too many of them, and few have stood out for anything other than the camera. Any positive connotations have been dampened over the years, and Microsoft can’t revitalize mobile with a diluted brand. Microsoft does have a hardware brand that’s built up a consistent positive reputation for build quality, performance, and innovation: Surface. The Surface Book is a device that actually got people excited. It’s taken a while to get it all right, but the Surface Book and Surface Pro 4 were released to common acclaim. The Surface Book’s announcement last October was met with a literal standing ovation by the press audience. They may not match the following Apple’s built with its MacBooks, but they’re arguably the best Windows PCs out right now. And Microsoft knows this. The Surface brand has become more than just a 2-in-1 tablet; it now covers a legitimate laptop and gigantic conference computer too, and I’ve actually started to see Surface devices in the wild. That Microsoft didn’t launch a Surface Phone to spearhead Windows 10 Mobile is more surprising than not. Maybe that was on purpose. When the Lumia 950 series arrived, Windows 10 Mobile still had some glitches and kinks to work out, as evidenced by the fact that the OS was only released to the wider public this month. 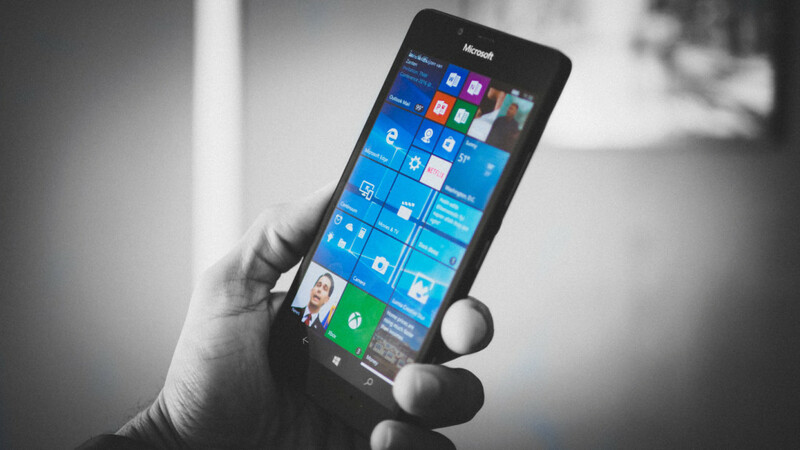 Maybe the Lumia 950 really is something of a dev kit, a powerful phone made only for Windows die-hards as Microsoft works out the issues with its OS before unveiling a killer device. The Surface Book brought something interesting we’ve never seen before. A Surface Phone will have to do the same. That device will have to deliver something we’ve never seen before – not to mention nailing the design, performance and software – for Windows 10 Mobile to build any momentum. It has to match the innovation Microsoft has recently aimed for with Windows, its PCs and HoloLens, and Microsoft need to reduce its mobile portfolio to just a couple of devices per year. Hopefully that means a legitimate Surface Phone – as the rumors continue to suggest – or something different altogether. We’re unlikely to hear about a new device at Build this year, but one can hope. Either way, I don’t think we’ll be seeing a new Lumia in 2017. It’s been a good ride.